Mastery’s first newly constructed school, Cramer Hill Elementary utilizes the latest approaches in construction technology. 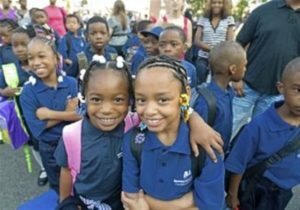 CAMDEN, NEW JERSEY, UNITED STATES — The start of the new school year will be a fresh start, in more ways than one, for the Camden community that the new Mastery Cramer Hill Elementary school will serve. “This brand new, safe and beautiful facility is one step in the right direction offering a world class education to Camden kids,” says Joseph Ferguson, Chief Operations Officer, Mastery Charter. The city of Camden suffers extremes of poverty, and is reported to have among the nation’s highest violent crime rates. Many kids are in schools that are historically lower performing – in the bottom 10 per cent statewide – some in classrooms with no windows and no natural light. So impressed with their approach to education, talk show host Oprah Winfrey generously donated $1 million to the Mastery Charter organization. Panorama photo of the construction of the Mastery Cramer Hill Elementary School vegetated roof. 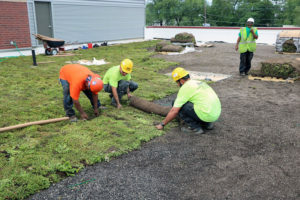 In addition to superior stormwater management, the vegetated roof offers other benefits for the building and the environment such as cooling the building, prolonging the lifespan of the roof itself, providing natural habitat and reducing the urban heat island effect. Also, research shows that biophilic design has direct advantages to students and teachers as views of natural landscapes from classrooms benefit academic achievement and behavior. Ferguson, who is overseeing the construction of Mastery’s brand new building, is excited, too. With school just around the corner, the team continues to work hard on the finishing touches to welcome new, eager students who will learn to love to learn. Mastery Charter operates 24 schools in the cities of Philadelphia and Camden. 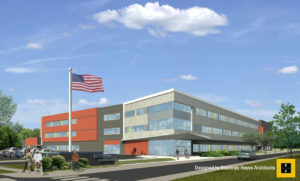 Cramer Hill Elementary is their first newly constructed school and will welcome up to 750 students and their families from kindergarten through 8th grade. From music to art to field trips – students will get a well-rounded education. Mastery schools are a special place where children experience the joy of learning in a safe, positive environment with a focus on 5 core values: respect, responsibility, hard work, teamwork and kindness. 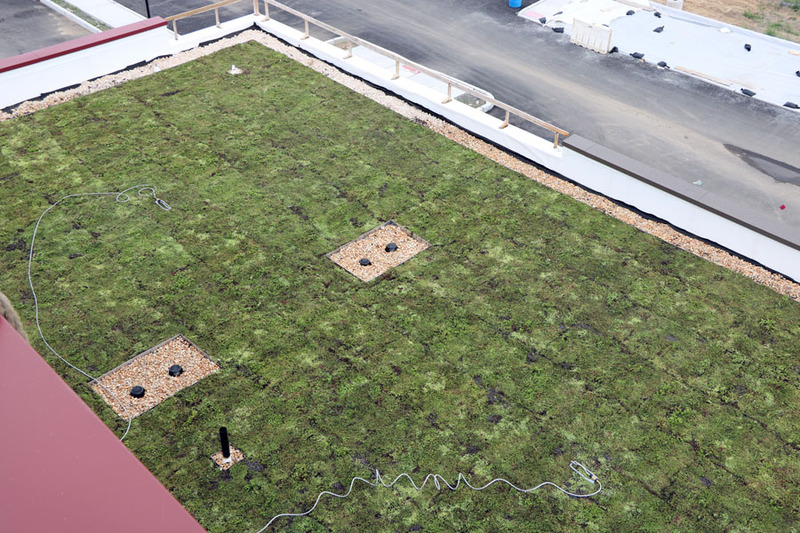 Innovative and easy to install, this green roof system is enhanced by the Urbanscape® Needled Hydro Mineral Blanket to maximize stormwater retention and keep weight down. 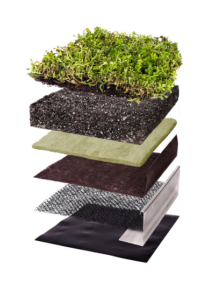 The vegetated roof system uses pre-grown mats, engineered growing medium and high performing base layers loosely laid on a Sika Sarnafil roofing membrane making a more reliable roof. 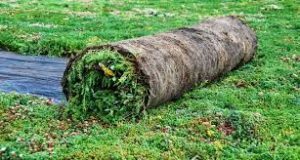 StormCap™ vegetated system has superior water retention properties. 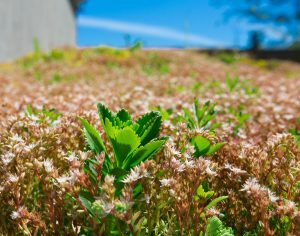 Contact us with about your green roof project. We can help design and supply the right system for your building and location. 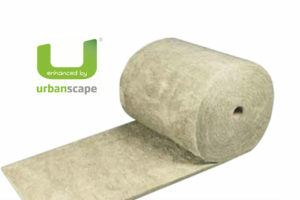 Please contact us by email info@stormwatercaptureco.com or call 855-786-7626.